Please consider making a donation using the PayPal button above, this will mean that the podcast remains free to all and will also help me create other free online entertainment. I am also trying to raise funds to start making this podcast in a studio with live bands. 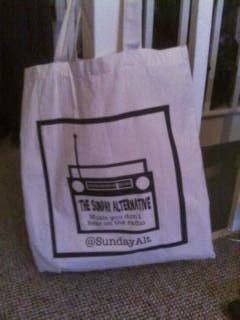 The Sunday Alternative bag is available now. All money goes into the fund to create entertainment that will be made available for free. They are £6 (including postage in the UK, If I get any overseas orders I'll have to have a rethink) and all you have to do is hit the PayPal button, donate £6 (or more if you're feeling generous), and then email me with BAG in the subject line and your name and postal address in the email body.